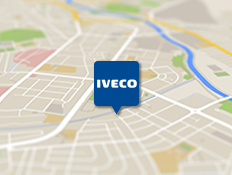 Sign up to be the first to hear from IVECO about vehicle information, latest news, offers and events. www.Iveco-dealership.co.uk is a site operated by IVECO LIMITED ("We"). We are registered in England and Wales under company number 1975271 and have our registered office at IVECO Limited, Cranes Farm Road, Basildon, Essex SS14 3AD. Our main trading address is IVECO Limited, Cranes Farm Road, Basildon, Essex SS14 3AD.. Our VAT number is GB 579 452 984. We may update our site from time to time, and may change the content at any time. However, please note that any of the content on our site may be out of date at any given time, and we are under no obligation to update it . Whenever you make use of a feature that allows you to upload content to our site, or to make contact with other users of our site, you must comply with the content standards set out in our Acceptable Use Policy http://www.iveco-dealership.co.uk/privacy-policy. Any content you upload to our site will be considered non-confidential and non-proprietary, and we have the right to use, copy, distribute and disclose to third parties any such content for any purpose. We have the right to remove any posting you make on our site if, in our opinion, your post does not comply with the content standards set out in our Acceptable Use Policy http://www.iveco-dealership.co.uk/privacy-policy. The website in which you are linking must comply in all respects with the content standards set out in our Acceptable Use Policy http://www.iveco-dealership.co.uk/privacy-policy. If you wish to make any use of content on our site other than that set out above, please contact ivecovehicles@iveco.com. "IVECO" "Daily" "Eurocargo" "Stralis" and "Trakker" are trade marks of IVECO Limited . To contact us, please email ivecovehicles@Iveco.com.